At Wildway Bushcraft we enjoy the changing of seasons, especially autumn, as it offers an opportunity to forage some lovely nutritious and delicious foods. From nuts seeds and berries, there is a lot you can gather while the weather is still fine. Foraging is about finding food from nature, but you should only pick what you need and make sure you leave a good amount for the nearby wildlife to enjoy. Here we share our top foods to gather at this time of year. Rosehips were used as an alternative for citrus fruits during the Second World War and used to make a rosehip syrup and to add flavour to foods. Discard the seeds and just use the flesh of the fruit and make syrup or jelly with either wild dog rose varieties or the more common Japanese Rose. Full of Vitamin C, they are a good nutrition-packed snack. You can find these fruits in hedgerows, rough grass and scrubland. It grows up to 3m high with pink or white flowers and the fruit is orangey red and rectangle shaped. Be careful of the thorns when you pick them. An easily recognisable plant, raspberries will be coming to the end of their season soon, but you should still be able to gather a few. It is a spiny fruit with toothed oval shaped leaves and a white underside. Crab apple trees are deciduous and grow up to 10 metres tall. The round fruit is very tart and comes in a variety of colours and ripens from October. 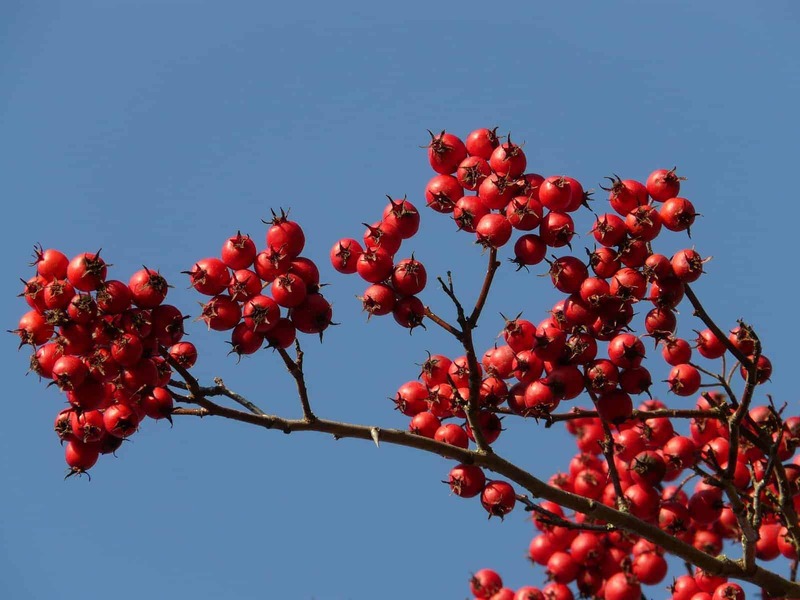 Crab apples are great for making jams and jellies accompanied by other fruits like blackberries, rowan berries and rose hips which also ripen around this time. Tasting similar to a walnut, these tasty nuts grow with four, three-sided nuts to one brown prickly shell. The tree can grow up to 40m with bright green and oval shaped leaves. You are competing with the local squirrels for these so you will need to gather early. You will need to look in woodland and hedgerows for a medium sized tree or shrub with distinctive rough bark and mid green coloured leaves. These berries are small, sweet and are a dark-red, purpley colour, packed with vitamins and antioxidants. They grow in clusters and have green, slightly toothed leaves and are perfect for sweet pies, jams and crumbles. Their rich deep flavour also makes them ideal for wine making. They might only be small and can be difficult to find, but these berries are definitely worth the effort. Full of delicious flavour, they are best eaten straight from the plant. They can be found low on the ground in open woodland and on grassy banks. The fruit’s shiny, toothed leaves are in clusters of threes. These may prove difficult to find as you will be up against the squirrels again. The nuts are perfect for picking when the leaves are just starting to turn yellow. At first you may think that a bush is bare, but if you lift the branches you will often see that they’re hiding underneath as the nuts grow under the leaves. You can also give the branch a shake and then look underneath. Found in hedgerows, woods and scrubland, the leaves are round, downy and toothed while the nuts are enclosed in a green, leafy shell. There are a variety of species of hazel which produce nuts. You can eat them when the shells are still green, if they have a developed nut inside, these are delicious. Dry the nuts in a dry dark place and you can use them dry or roast them. The seed heads are perfect for picking when they are a grey-brown colour and have small holes underneath the flat top. If you put the whole seed heads into a paper bag and shake, you can easily take out the heads leaving the seeds in the bag which can be used for sprinkling on rolls, bread and cakes or as a tasty snack to nibble on. Most of us have probably picked blackberries at some time. The prickly shrub grows in hedges, waste places and woods and has prickly leaves that turn a reddish green in the autumn. The berries should be a deep purpley black when picked. Berries should be used the same day that they are gathered. Use them for jams, chutney, wine, or freeze the berries to use in the future. This shrub can be found in scrubland, woodland and hedges and on heaths and downs. Its leaves are a glossy green and found on spiny branches. The round red, nutty tasting berries are called haws and grow in small bunches. Has this inspired you? Find out more about foraging and other bushcraft techniques by signing up to one of Wildway Bushcraft’s courses and see what you can discover in the great outdoors.